Current advances in technology and research have triggered accelerating change in the state of serials, which makes keeping up-to-date on developments difficult. Mile-High Views: Surveying the Serials Vista: NASIG 2006 presents the leaders of serials publication providing their perspectives on the state of the world on the future of serials. This compilation includes several superb presentations from the 21st annual North American Serials Interest Group conference held in Denver, Colorado, in May, 2006. Mile-High Views: Surveying the Serials Vista: NASIG 2006 explores serials publication through helpful reviews of cataloging and techniques for implementing various projects. Also included are chapters exploring visions for the future, strategies for practical application of technology and theory, and tactical information to manage employees and economic resources. This book brings readers the world of serials as it is todayand as it will be in the future. 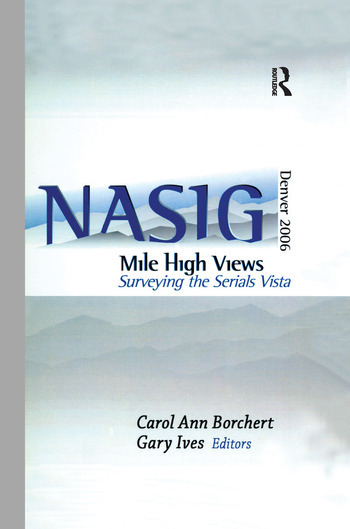 Mile-High Views: Surveying the Serials Vista: NASIG 2006 is a horizon-expanding collection that is perfect for librarians, publishers, and commercial vendors interested in the future of serials publication. Carol Ann Borchert, MLS, MA, BBA, has been the Coordinator for Serials at University of South Florida (USF) since 2004. Previously, she was in the Reference and Government Documents departments at USF, and in the Cataloging, Serials, Reference, and Government Documents departments at Furman University’s James B. Duke Library. She has been an active member of NASIG since 2004, with service on the Nominations and Elections Committee. Gary Ives, MLS, BA, has been the Assistant Director of Acquisitions and Coordinator of Electronic Resources at Texas A&M University Libraries in Texas since 2001. Previously he served as Associate Director for Information Resources at the Medical Sciences Library, at Texas A&M University. He has previously been with the Medical Sciences Library, Texas A&M University, the Moody Medical Library, University of Texas at Galveston; the University Library, University of Texas at El Paso; and the Claude Moore Health Sciences Library, University of Virginia. He has been an active member of NASIG since 2002.